The elevated fingerboard design for steel string and classical guitars offers the player and the builder many different advantages over the traditional design such as better tone and upper fret accessibility. 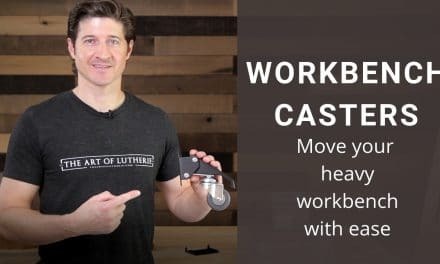 Many builders and players haven’t tried this wonderful feature yet, partly because there isn’t very much material available explaining its benefits and how to execute this in their own work. 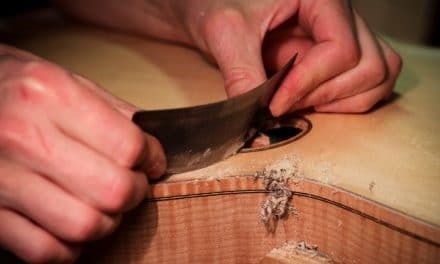 If you have been building guitars for very long, you may have experienced some challenges in achieving the correct geometry between the neck and the body of the guitar. 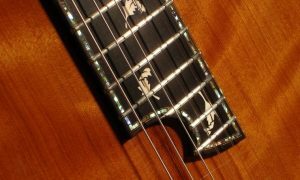 The area where the fingerboard typically extends out over the guitar body can be problematic at times for a verity of reasons. 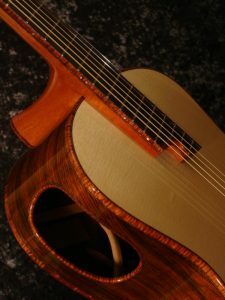 I find that using the traditional design for steel string and classical guitars, although time tested and good in its own way, can be very limiting to the builder of custom hand crafted guitars. Specifically regarding the fingerboard extension area and the geometric relationship of the neck to body. 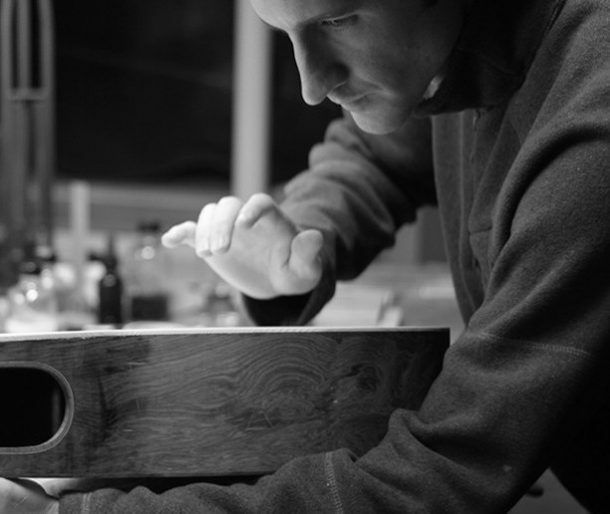 Can produce cracks in the spruce top due to differing expansion/contraction rates of ebony and spruce. Fortunately all of the limitations of the traditional design can be overcome by incorporating the elevated fingerboard design which we will now look at in detail. 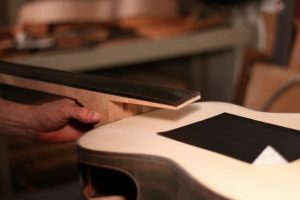 An elevated fingerboard allows the builder the freedom to change the angle at which the neck approaches the guitar body. With the traditional steel string guitar design you are forced to use roughly a 1 degree back-set or whatever the plane of the soundboard dictates. Sometimes I want to have the neck approaching from a different angle for tonal reasons, or simply to make the strings feel different; tighter or looser to the player. The elevated fingerboard design gives me that option. This is also very helpful in achieving accurate saddle height and other fine adjustments which can be used to fine tune not only the feel of the guitar, but the tone as well. Another nice feature of the elevated fingerboard is the option to tilt the neck toward the player, or you could say toward the bass side. If I choose to incorporate this, I make it very subtle. So much so that it usually isn’t noticeable consciously to most players, but I can see them enjoying the extra comfort though they may not understand why. The intersection of the arching of the soundboard with the asymmetry of my guitar body shape does this naturally for me in my design. However one could do this by very subtly tilting the neck toward the bass side of the guitar, removing slightly more wood from the under the bass side of the elevated fingerboard extension. This also results in a saddle that is more even in height from bass to treble sides, even though the action may be higher for the bass strings. The elevated fingerboard also provides added comfort when reaching the upper frets while playing the guitar. Having additional height above the soundboard gives the left hand more room to accurately finger chords and notes above the 12th fret as compared to a standard set up with the fingerboard glued to the top of the guitar. With the elevated fingerboard you don’t have to worry about the ebony cracking the spruce top of the guitar as it shrinks over time at a different rate. With the elevated fingerboard there is the mahogany or Spanish cedar from the neck under it to pad the different rates of expansion and contraction between the ebony and spruce. Lastly and most importantly, the elevated fingerboard will alter the approach angle of the strings relative to the top of the guitar. This steers the sound of the guitar more into the direction of the harp which has a very steep approach angle. I find this to be a big advantage tonally as well as structurally since more of the string force is pulling in an upward direction rather than pulling in a direction almost parallel to the plane of the top as in a traditional arrangement. 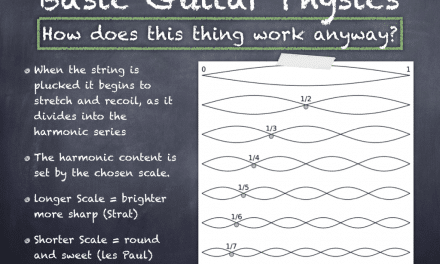 I talk about this in detail in my guitar physics and set-up course. 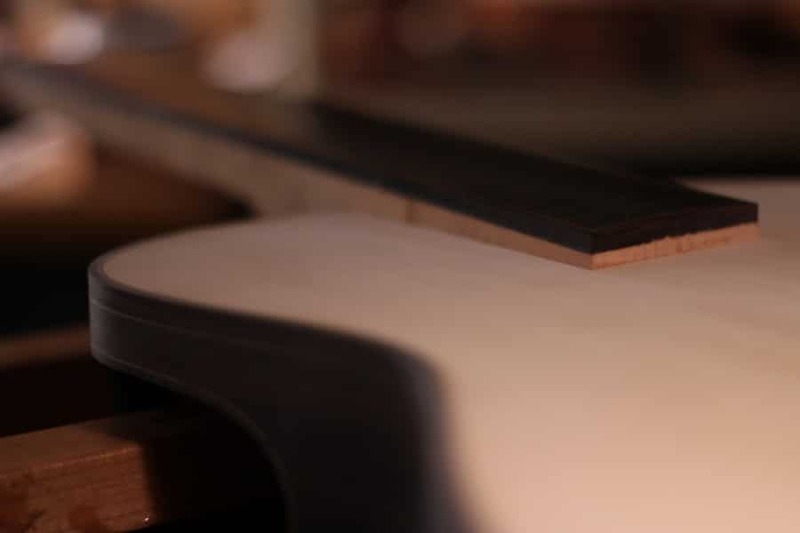 The simplest way to incorporate the elevated fingerboard into your design is to flip the body taper into the revers orientation that it would normally be. What I mean is that most guitars are deeper at the tail block than at the neck block. 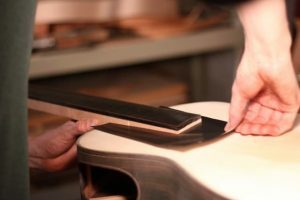 Many builders accomplish the extra side depth at the tail block by adding the side depth toward the back of the guitar. Doing this makes it so the top stays at about a 1 degree angle relative to the neck angle on a steel string for example. This is necessary with the traditional design in order for the saddle to be the proper height. And for the fingerboard to be able to glue to the top of the guitar it must have this relationship. 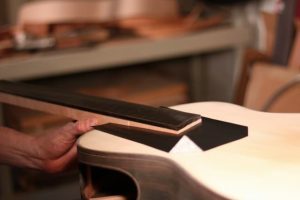 However, by adding the extra depth to the sides toward the top of the guitar at the tail block, the top is now on a different angle relative to the rest of the the guitar and neck. If the difference in side depth between the neck block and tail block is for example; 10mm, then you can make your elevated fingerboard 10mm. When the fingerboard is added to that, you will have the same neck angle relative to the sides of the guitar as usual. But you still gain all the advantages listed earlier including the sweeter harp-like tonal direction caused by the different angle of approach you now have with this new geometry. 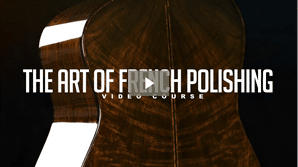 Now you know how to incorporate and calculate the height of your elevated fingerboard, so the next issue is how to fit the part of the mahogany or cedar neck that extends over the body. Don’t worry, this is very easy to do. Coming from a background of building archtop guitars I never even gave it a second thought because with archtop guitars we do it all the time. 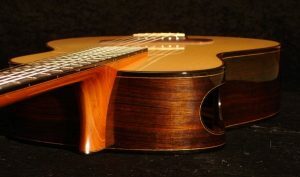 On an archtop guitar it is more complex because the builder has to fit the neck extension to the curve of the top arch. For the steel string or nylon string guitar, the neck extension area can be left in the subtle curve of the top’s dome or sanded flat, whichever you prefer. I first cut the neck extension to the rough dimensions and then begin test fitting and working it down by hand with my plane and chisels until it is very close to perfect. I am also establishing and adjusting the neck angle I need for the target saddle height while doing this as well. I do this simply by eye up to a certain point. When I feel I’m close enough, I switch to sandpaper and maybe a scraper blade. I start refining, still by eye, and when I have gone as far as I can I use the following method. I simply place a piece of carbon paper under the neck extension area and hold the neck in place. Then I slide the carbon paper out and remove the neck. The wood that needs to be removed will be marked and kind of dirty looking from the carbon paper. I simply sand away the marks and repeat this process until I have a flawless fit. I do several fittings, one when the neck is very rough without the fingerboard in place, to get it close. I am also aligning the neck with the center line at this point, as well as making sure that the angles are correct for the proper finished saddle height and other refinements. The guitar pictured is a fanned fret guitar with an asymmetrical body joint. This takes the geometric complexity to a whole new level. That’s the challenge I love about it though, to take all these different and very complex geometric interactions and make them look refined and simple, that is the art of it. After I like the initial fitting, I can glue my fingerboard in place on the neck blank, which at this time in my system is not attached to the body. Then I radius the fingerboard and refit again. I’m keeping in mind that after I put my frets in place they will probably force the neck extension to bow down a bit which is OK, but something to keep in mind because it can make fitting the neck extension more difficult. I try to have the vast majority of the fitting done before I install the frets. I also shave off more of the fret barbs from the frets that go in the neck extension to reduce the amount of bowing pressure caused by the tightness of the fret in the slot. This also helps for re-fretting and makes it easier to get the frets out from the neck extension area cleanly for a perfect re-fret job if one is necessary someday. 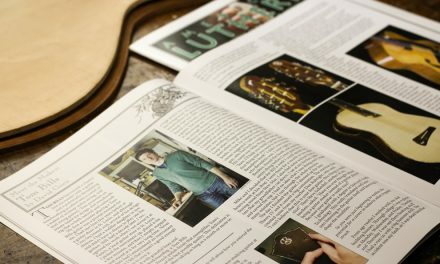 Join Luthier’s EDGE and get access to a growing library of exclusive guitar making luthier courses, tutorials, and more. I am a long time wood worker, and make my living as a custom picture framer. I have studied the classical guitar for some time now, and I am about to start my first build. I would like to incorporate an elevated fingerboard, as my best guitar by Cervantes has this and I love it. Any advise as to how to tweak the traditional execution or general advise on a first build would be greatly appreciated…your article is great…thank you. BTW…your sound ports look huge!!!!! I love the sound port on my Cervantes…..what made you decide to push the size? 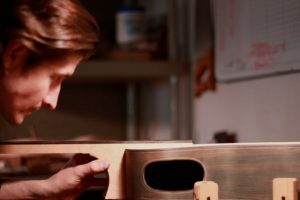 I arrived at the size of the sound hole by building a guitar, cutting a smaller hole and slowly enlarging it little by little until I reached the size where the sound of the guitar was just right and perfectly in tune. Where the body cavity resonance and the top and back main modes sounded pleasing to me. That’s how you can make something astoundingly complex mathematical and make it simple. PSS……..how can I modify the traditional solera to compensate for the elevated fingerboard? I think there was also an article Greg wrote in GAL http://www.luth.org/ about his process several years ago which showed each step if I remember correctly, I could be wrong though. Excellent article. I wish I had found this a couple of months ago. Last year I built my first guitar with an elevated fingerboard. It’s a classical with a Spanish heel, and that did somewhat complicate matters. I ended up choosing to add an extra triangular block between the fingerboard and the top of the guitar. This worked very well, though there is a visible joint line there now. I find the sound to be very similar, perhaps slightly more focused. The extra angle at the saddle does seem to charge the top more, and that is making for a powerful instrument. Paul, Thanks for our comment! I know what you mean, my nylon string guitars are often asymmetrical body/neck joint, compound parabolic to architecture, fan fret, elevated fingerboard designs…talk about complex geometry. That’s what makes it so inspiring though! Yep. 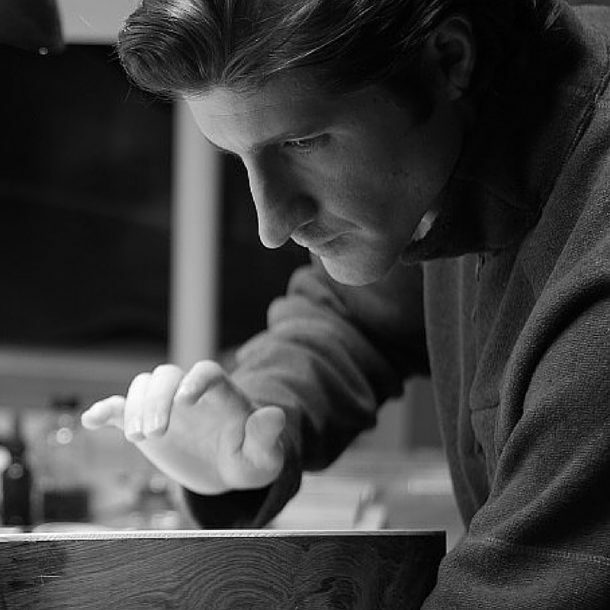 I’ve used many different methods over the years; everything from different shapes and styles of dovetails to bolts. 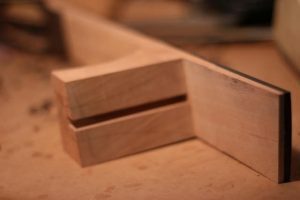 The spline joint is currently my favorite and the one that seems to work the best for my elevated fingerboard asymmetrical body joint guitars. Tom ,thank you for ALL THIS INFORMATION!!! WOW!!! The above article is great on elevated fingerboards. Any chance of you doing a step by step video for us dummies.??? It just clicks better for me when I get to see it. Also, is there a full arch top course in the future?? I would love to see one taught by you. Keep up the great work sir and thanks again……….You’re AWESOME! !